Recently we had a lot of debate was sparked by the news that on PINGDUODUO platform it was possible to purchase Beingmate milk powder products (whose original price would be 888 RMB) for only … 7.5 RMB. The first obvious concern by customers was whether those products were original or fake, or (maybe even worst) whether they had some kind of defect justifying such dramatic slash in the price. PINGDUODUO then issued a statement to confirm that these products were original and had no quality problems, and that the reason why they were sold at such cheap price was that they were near the end of their best-before date. It is obvious that expired products are not allowed to be sold; however, what about nearly-expired food? Well, this kind of products – which allows consumers to purchase real products at low price – certainly do have a market rather considerable in size, both online and offline. by online merchants from offline physical stores, where statistically most consumers are rather reluctant to purchase prepackaged with shelf life shorter than 6 months. This helps brick-and-mortar retailers to clear inventory and reduce their loss, while online dealers offer them at an enticing price to the broader audience of online shoppers. How is sale of “nearly expired food” (in Chinese: 临近保质期食品) regulated? As we have seen in a previous post, the shelf life date is defined under GB 7718 as “the date which signifies the end of the period under any stated storage conditions on the label of the prepackaged food during which the quality of the product will be maintained and the product will remain fully marketable and retain any specific qualities for which tacit or express claims have been made”. “Nearly expired products” are therefore legally to be considered as “non-expired products”, meaning that they remain fully marketable. At national level, we do not have a clear definition or standard for “nearly expired” food. However, this changes when we check local regulations. Some local governments such as Beijing, Shanghai and Guangzhou have introduced some legal provisions concerning “nearly expired products”. 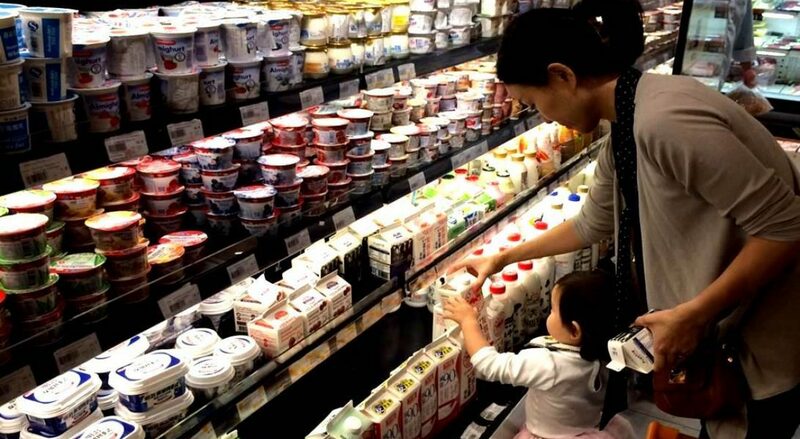 Food Safety Regulations of Shanghai Municipality of 2017 require that food producers and traders shall establish a management system for food and food additives near the end of self-life and mark in a very visible way concentrated storage, display and selling of food and food additives near the end of shelf life. The main aim of the provision appears in our opinion to prevent that food products – once expired – shall be recycled for human use, rather than to inform customers that the product they are about to purchase is about to expire. This is however covered by another AIC regulation in Shanghai (a 2012 “Proposal to seriously implement the requirements of AIC, take the initiative to accept supervision, and effectively strengthen the management of food nearly expired”), which requires that supermarkets shall prepare an area where the “nearly expired food” shall be displayed, with clear notice in this regard. Specific warning should also be provided when nearly-expired food is sold jointly/tied to “normal” food. Very important, this Proposal also specifies the thresholds for a product to be considered as “nearly expired”: 45 days prior to expiry date (if shelf life is longer than 1 year); 20 days prior to expiry date (if shelf life is between 6 months and one year); 15 days prior to expiry date (if shelf life is between 90 days and 6 months); 10 days prior to expiry date (if shelf life is between 30 and 90 days), etc. Another 2017 AIC regulation in Shanghai specifies thresholds and obligations for management of nearly expired food by food producers and traders. In Beijing, as well as other cities (Kunming, Guangzhou) or provinces (Zhejiang) we have other similar regulations, which however all differ between each other in terms of thresholds – meaning that food companies having operations in different cities or provinces may have to adopt all such different standards (for example, in Beijing any food with expiry date less than 15 days is considered nearly expired starting from 4 days before expiry date; however in Guangzhou products with shelf life between 2-15 days are considered nearly expired one day before the expiry date; in Zhejiang products with shelf life between 10-30 days are nearly expired 2 days before the expiry date, while those with shelf life less than 10 days are nearly expired the day before the expiry date). As for online sale, it seems that we do not have clear provisions about noticing consumers about products “near shelf life”. However, providing correct information in this regard will help online operators to avoid legal disputes with consumers – who may possibly complain if the product is actually delivered after on upon expiry of shelf life, thus invoking breach of mandatory provisions of consumer protection law, or quality law. Cases such as the above-described PINGDUODUO one are not rare, and they are usually resolved through negotiations (and by granting some kind of compensation/refund to the consumer).